Week 2: Week two was all work no play. We started our project placement, Spanish and Medical anthropology Classes. My project placement was at Fundacion Oaxaqueña de Equinoterapia. My partner and I were the first students from Rutgers to be placed here for work. It was quite an experience, we provided horse therapy to individuals with special cognitive, physical and emotional needs. I was expecting to observe on the first day but i was wrong. Work began the moment I got there. I had never interacted with horses in the past, so my first job was to clean the horse and get it ready for providing therapy. It was exercise given to me so i could bond with the horse. The same exercise is given to new patients, the reason being that the patient and the horse need to get acquainted with each other before a therapy is given to the patient. 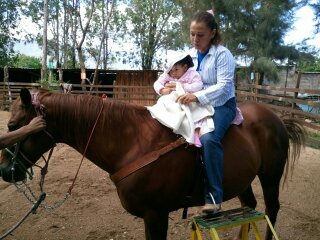 My horses name is Sikaru, it is a Zapotec name that means beautiful. During the therapy, the patient rides the horse with the therapist. My job was to walk the horse and control the horse while the therapy is being administered.The first day i provided therapy to Sofya, a year old infant who suffers from Cerebral Palsy. Cerebral Palsy is a neurological disorder that may be caused by brain damage at birth due to hemorrhage or lack of oxygen, early infections of the brain such as meningitis, or traumatic head injuries. It leads to poor muscle function and impaired muscle coordination. Equine therapy helps to improve nerve and muscle coordination as well as muscle strength, and it also helps to prevent further dysfunction that could result from contractures caused by decreased use of muscles and joints. The horse’s rhythmic movement helps to strengthen muscles that are used in walking, sitting upright, breathing and speech. My work was very hands on I also had the opportunity to watch a session between individuals with special emotional needs and the psychologist. I work on tuesdays, thursdays and saturdays. Thus far I like my placement and im looking forward to learnings new things which I will hopefully be able to use in the future.